I met Hayley Carmo at Renegade last month, drawn to the pretty mixture of award ribbons, printed textiles and illustrations all layed out in her booth. I went home and immediately went on her site to check out what else she's done - pretty much everything! I don't think there's anything Hayley can't do. Check out her site and see for yourself! 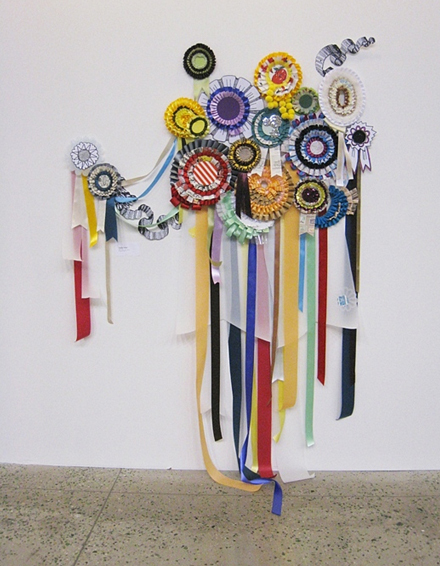 She's also just opened up an Etsy shop - Kindly where she sells her ribbons and printed textiles. I work for Anthropologie in Philadelphia. My fiancé Jeff and I are going to be married in January. I finally just opened up my Etsy shop and have been delving into hand printed textiles. 2) What was it that made you want to start creating? Did something specific trigger it? I don’t think there is one single thing that I could say started me creating. It’s something that has just always been a part of my life. Asking why you create or make is kind of like asking, why do you get hungry and then eat? It’s something that you can’t really help or go without. I know there have been points of inspiration that spur me on. Things like, being exposed to the arts from a young age, and love for art and history kind of propel you along the way but its pretty impossible for me to find its point of origin. 3) Artists, designers, bloggers who often work from home alone (all day long) develop some pretty unique and quirky habits. Can you share one of yours? I'd like to think that I have pretty normal, sort of boring, working habits. Maybe I’m just not aware of anything too unusual. I do always keep a big box under my desk for all of the little scraps I don’t use, and drawings that don’t make the cut. I save everything. Who knows, it might be just the scrap I need in a future project. The most important thing is, I have to have a clean, semi-organized workspace. I just can’t function any other way. Here’s a picture of the desk in my work area. Above on the shelf you can see the makings of what hopefully, one day will one day be a fabulous toy ice cream collection. I also adore my little rabbit vase on the desk. 4) How do you come up with your drawings & paintings? Can you walk us through your creative process? Mentally, I start my next drawing while I’m still working on the last. The act of working gets my mind tumbling over new possible images. It’s kind of like a little chain that builds on itself. I don’t really do much sketching or preliminary work. I just start. A lot of the works I do on paper have to do with Synesthesia. To make a long story short, this is when your brain crosses sensory inputs, kind of jumbles things up. For example, thoughts have taste, sounds and words have colors. Often, I’m working with the goal of translating those synesthetic experiences and sensations two dimensionally. I think the constant in all of my work is the idea of presenting reality, and then the undoing it, the loosening up of line and color. By the way, the true meaning of 1987 and 1988 is meaning B! 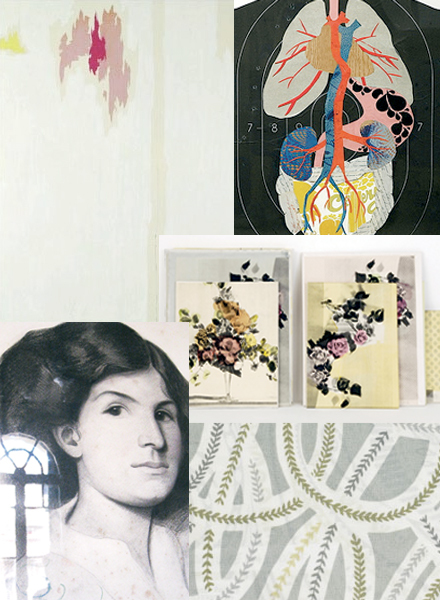 I love her inspiration board - it would surely inspire me! Absolutely beautiful work....I wish I had seen her booth, hope you are having a wonderful mini break hun! wow - her work is amazing and she works for Anthro! Thanks for sharing the interview and have a great long weekend! so glad to see this! since renegade i've been looking at hayley's work and really like it! Sigh...I love the chaine Liberty of London fabric and wish I carried it in my store. I am starting to see it around everywhere all of a sudden! oh I love how you put this together! I always enjoy seeing artists work spaces too. It's a view into their world that you typically wouldn't see otherwise. being new to blogging about arts and crafts, i was looking for bloggers with similar interest and came across your site. i was very impressed and inspired with your taste and talent! anyway, hope to learn more from you. I love her work! I am bummed I missed it at Renegade. I need to walk around more next year. its so amazing. i like all the colorful things most all of them.really nice post. 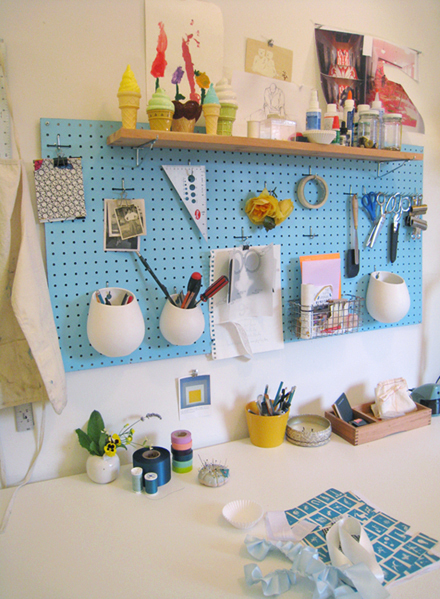 I LOVE her workspace! Such beautiful colours and so organised.